Powers: Celia generates and controls aspects of the electro-magnetic spectrum. Displayed powers include projection of heat, cold and electric energy, the manipulation of metal through magnetic forces and the ability to fly.She can also see the world in terms of energy such as ultraviolet light and infrared. When manifesting her powers her hair appears to be on fire though she has no fire related abilities. 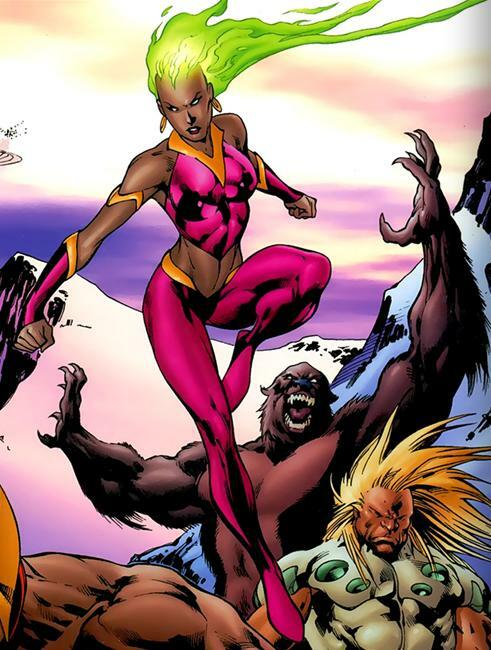 Celia Winward was a Jamaican living in Great Britain when the guardians of the universe (creators of the Green Lantern) decided to recruit and empower ten earthlings to be their successors as the “new guardians”. Celia was the fifth person empowered by them. Over the course of her adventures Jet apparently contracted a celestial class disease and sacrificed her life to save earth. Years later she returned to life since she had been granted Immortality by the Guardians. Celia also became the leader of the new Guardians now with additional members called the “global guardians”. Fellow black superhero Freedom beast of Africa also joined their ranks. The team was then mind controlled into fighting Green Lantern Hal Jordon. Once freed they continued to police the globe and assisted Checkmate in stopping an apocalypse. ← Miles Morales- New Details revealed!! !